I feel an immense sense of pressure for this first post to be something special. Like almost every single blogger I come across, I have long been searching for a creative outlet and somewhere to share and document my thoughts, experiences, aspirations and hopefully my own design work. This seemed like a pretty good place to start... A couple of weeks ago we made a very last minute decision to embark on the (almost!) four hour journey on a Friday evening to spend the weekend in Norfolk and catch up with a couple of friends.The welcome from Toby and Eleanor was so unbelievably warming I completely forgot that this was only the second time we had met. Having signed up to run a ridiculous amount of miles throughout September we decided to brave the rain and head out for a swift Saturday morning run. However after a few minutes we found ourselves running in an open field with absolutely no idea where to go, and more importantly where we were allowed to go. Just about to turn back to find a path, we spotted a small soggy terrier followed by a small soggy man jogging towards us and holding something close to his body. We were invited to join the small soggy man and his terrier for the rest of his route. He was on his way home from collecting blackberries to make jam - hence the strange package! We learnt all about how this chap lived not far from where we were staying, how he has his own honey bees and likes to crush and freeze his raspberries to make jam rather than boiling it. Returning to the house soaked head to toe I felt a little like it had been some sort of a strange dream - chasing an old blackberry picking, honey harvesting man through the fields and woods of Norfolk. The beach was our next stop before lunch. The grey, drizzly weather actually gave the beach a lovely hue, and made it feel calmer. It was different to the beaches we are used to in the South West - there were no cliffs. The beach was surrounded purely by fields and greenery. We managed to spot the local delicacy - Cromer crab - but unfortunately the seagulls had got there first. All that was left was the odd claw or shell! We also spotted a cheeky seal, bopping up every now and then whilst making his way towards a couple of fishermen - no doubt planning to sabotage their morning! Toby and Eleanor work at the Cafe and Restaurant at the beautiful Wiveton Hall. Having heard about the delicious menu and how the estate has been the focus of the BBC Two series titled 'Normal for Norfolk' we thought it would be rude not to visit for lunch. The decor inside the Cafe is refreshingly bright and vibrant, yet has a welcoming and homely vibe. We really were not disappointed with the food. 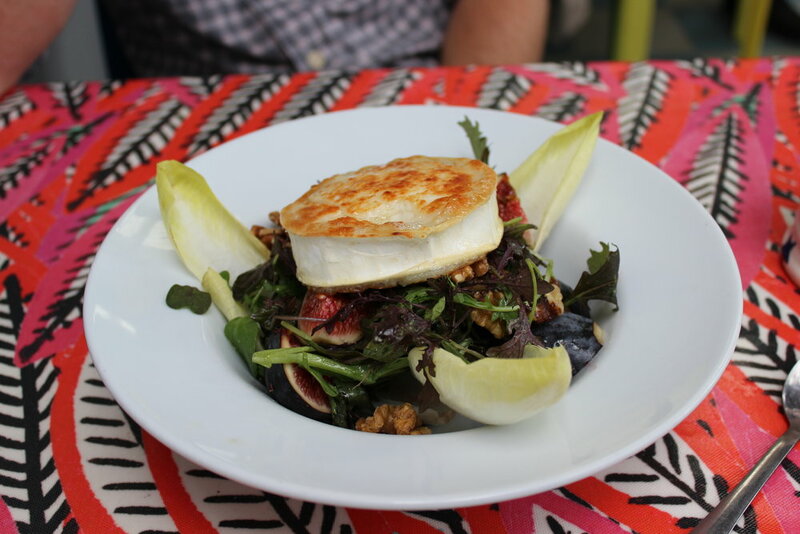 I had the Welsh Rarebit and Dan had the Goats cheese, Fig and Walnut salad - always a winning combination! After lunch we were shown the beautiful walled garden used to grow the fruit and vegetables for restaurant. We munched on deliciously ripe mulberries and figs as we took in the space before us that was absolutely full of wonderful flowers, fruit, vegetables and herbs. My favourite spot was the greenhouse used to grow tomatoes and basil - I like to think that growing the two together would result in some kind of basil infused tomatoes - yum! I also spotted the biggest pumpkins I have EVER seen! Saturday evening was spent cooking. And I mean the entire evening. Dan, Toby and Eleanor share a love and knowledge for food that I am envious of. It's not even just the eating that excites them - it's the whole process of combining flavours and textures to create something delicious, especially if it's a slightly unusual combination. We each decided upon a small dish to create, and dined on a feast throughout the night; grilled chilli corn on the cob, crab linguine, sushi, and jerk chicken with courgette fritters. Yum! Sunday took us to a beautiful nearby village and the Duck Inn at Stanhoe for lunch. I felt a little sad that we only had two days in Norfolk, yet in that short time I felt so rested. Sometimes just a change of scenery can help to revive you, and make you forget about the worries and stresses of the week ahead. I would like to dedicate this first post to Toby and Eleanor, and to thank you both for making us feel so welcome (and giving me a wonderful weekend to write about!) I would also like to thank you for helping us to understand just what is 'Normal for Norfolk'!